The BMW i3 electric and i8 plug-in hybrid cars are heading off for a year-long world tour, starting in Rome, leading up to the launch of production versions of the car. Before sending the BMW i3 and i8 electrified cars to show-rooms, the company is sending the i3 Concept and i8 Concept on a world tour. The tour launches from Rome in late June, and will hit several major cities around the world over the following year. The BMW i3, originally introduced as the BMW MegaCity, is an all electric sedan designed for urban areas. It packs a powerful 125 kilowatt (170 hp) electric motor, that offers a 0-60 time of 8 seconds. The motor is already being used in the BMW ActiveE, and is 40 percent smaller than the system used in the BMW Mini E. Renewable raw materials are a defining characteristic of the interior, with some panels made from natural fibers. It has a trunk capacity of 200 liters, and there is another usable storage area in the nose of the car. 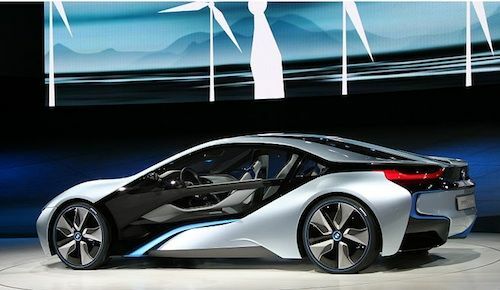 The BMW i8 is a plug-in hybrid sports car. It packs a modified version of the i3 electric motor coupled with a small 3 cylinder engine, that together produce up to 164 kilowatts (220 hp) of power. It offers a 0-60 time under 5 seconds and 104 miles/gallon fuel efficiency. The lithium-ion battery provides 20 miles of electric driving range, and can be recharged by plugging in or from the engine. The 2+2 seating supports carrying four people. The BMW i concept is to redefine personal mobility, and to introduce sustainability throughout the production chain. The concept features weight reduction, aerodynamics, engine efficiency, and use of electric or plug-in hybrid drive train technology, all of which go together to create highly efficient vehicles. The chassis is made from high strength aluminum, while the upper part of the car is made from carbon fiber reinforced plastic (CFRP). The i3 Concept car includes the BMW Parking Assistant and Traffic Jam Assistant features. The Parking Assistant completely takes over the parking process, completely relieving the driver of parking the car. Hopefully meaning no more dings. The Traffic Jam Assistant takes over driving in heavy traffic using a "go with the flow" philosophy. It maintains a safe following distance between other vehicles, can follow the lane, and stay on course at speeds up to 25 miles/hr. The tour is slated for these cities and times: Rome, June 2012; Dusseldorf, September 2012; Tokyo, October 2012; New York, November 2012; London, January 2013; Paris, March 2013; and Shanghai, June 2013. Both cars are expected to go on sale in 2013. BMW expects to produce other vehicles in the i range in the future. Driving Impression of the i3 I drove the test mule of the i3 (the Active E) recently and it was fantastic. I am no fan of electric cars and I have driven the Leaf anf Volt and came away unimpressed. The BMW is a great driving car. John, I'm happy to hear you liked the the ActiveE. I've been driving one since January and it really is a great driving electric car. Yes it is a test mule for the i3, but think about this. The i3 has the exact same battery modules, electric motor, and power electronics as the ActiveE but is 1,300lbs lighter! It will have the same horsepower and torque as the ActiveE and 1/3 less weight (4,001lbs vs 2,750lbs) so as much as you enjoyed driving the ActiveE, imagine how much fun the i3 will be.